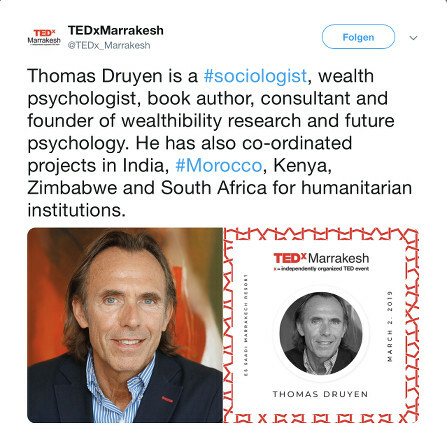 Since April 2019 Thomas Druyen holds the professorship at the University Mohammed VI Polytechnic (UM6P). 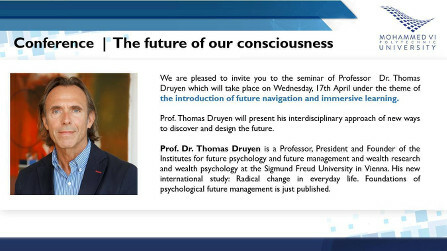 The first lecture of Prof. Druyen under the theme of „The introduction of future navigation and immersive learning“ took place on April 17th at UM6P. The seventh edition of TEDxMarrakesh will take place on Saturday March 2nd at Es Saadi Palace. This year’s theme is looking at the contexts and parameters we identify with and what criteria and circumstances define us – „WE ARE THE WORLD – IDENTIFYING IDENTITY“. Personal identity, social identity, cultural identity, digital identity, corporate identity….- how have they changed over the last decades? We are looking for your “idea worth spreading” on the topic! Digitalisation has accelerated globalisation in an unknown way. Over the last 30 years the world got more and more accessible not only for the elite and explorers, but for all of us. Information travels from one end of the world to the other in seconds. 5 billion people have access to the internet – and are “connected”- we are the world. But what does this mean for us as humans, organizations, cultures and their identity? What role does identity play at all in personal or organizational development or peace in the world? Today one identifies with mindsets, movements, etc. from anywhere around the world. We marry cross cultures, move over the globe and children are learning four languages on the way – what does identity mean to them? Sexuality opens up – how many sexes can we have? The more we move together, the more we want to differentiate ourselves – what does this mean for the world? For months, the IZZ has been cooperating with the Mohammed VI Polytechnic University (UM6P) and is planning a large study on Morocco’s ability to change. At this major conference, Prof. Druyen had the honor to open the three-day conference marathon with his futurepsychological perspectives.